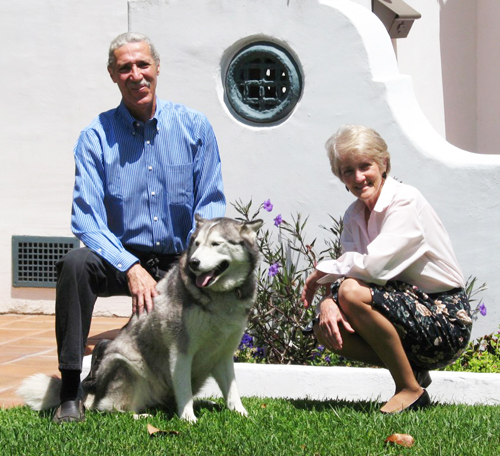 Edgar and Barbara Gonzalez in front of their historic home at 330 S. Ohio with their Siberian husky, Maya. Each year, the Margaret Atkins Award, named to honor one of Anaheim’s most dedicated preservationists, celebrates attitude and perseverance in historic preservation, and credits Anaheim’s true heroes who volunteer their time and passion against all obstacles to preserve our city’s significant architecture and public art. This year’s award goes to Barbara and Edgar Gonzalez. They have lived in their striking 1923 Mediterranean Revival house on 330 S. Ohio since 1985, and together, they've made a tremendous difference in the quality of the Anaheim Colony Historic District. In addition to making significant restorations to their own home, earning them an Anaheim Beautiful award, they've purchased numerous rental properties and meticulously restored them to their original architecture and historical integrity. They bought a tiny, run-down property on 308 S. Clementine and stripped the exterior siding down to bare wood, restoring the home to period-appropriate colors. The couple even tackled the restoration of an eight-room rental unit at 115 W. Stueckle, and set about restoring it to its 1923 vintage by furnishing all eight units with subway and hexagonal tile detail, vintage pedestal sinks and stoves, and refinishing the original cabinetry and wood floors. Upon completion, both properties became a part of the historic preservation/property tax reduction program called the Mills Act. A local realtor selling hundreds of houses since 1986, Barbara has served on the ACSD Board, and remains active in the Historic Preservation Committee, the Anaheim Historical Society, the Central District Neighborhood Council, and Anaheim Beautiful. Barbara also partners with fellow Realtor and this years’ Andy Anaheim Award winner, Meghan Shigo, to put together an annual calendar featuring pictures of Mills Act houses, distributing nearly 3,000 free of charge to residents of the historic districts and City Hall. Last, but not least, on their frequent walks through the neighborhood with Maya, their Siberian Husky, Barbara and Edgar can be seen picking up litter just to keep the city clean. Recently, we chatted with the Gonzalez's about restoration, community, and historic preservation. What is it about old houses that you love so much? Gonzalez’s: We love the architectural details, quality materials and meticulous attention to the craftsmanship of old homes, many of which are 60-100 years old and still functional. These homes depict the cultural values, trends and styles, and still utilize the materials available in the era. They provide historic continuity to the past, preserving those values for future generations. Why is the sense of community so important to you? Gonzalez’s: No man is an island. There is strength and momentum in numbers, permitting us to accomplish far more than in isolation. Each human being has a talent, skill or knowledge that can be shared to the benefit of society, in general, and to our neighborhoods. It makes a person feel valued when he or she can share a skill or provide a service that accomplishes a common goal. Life is more enjoyable when share among friends and neighbors and provides for safer and more close-knit communities. 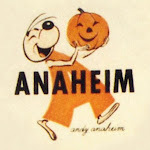 What do you see as some important issues in historic preservation for Anaheim? Gonzalez’s: Getting the message out that historic and architectural preservation is the “greenest” of movements. Older architectural features are lost when the houses they created are torn down or materials discarded. The integrity of the neighborhood is diminished when its character is lost. People who don’t care or don’t know better and use flimsy replacement materials thinking they are increasing the value and comfort of their homes, but they are depriving the house of its historic integrity. We have reached out to Mills Act participants and owners of historically contributing structures to preserve their homes, thus increasing their home’s economic and social value. We like to feel we have served as personal resources in helping our community to understand the value of our historic homes to the betterment of us all. Barbara and Edgar Gonzalez will receive the Margaret Atkins Award at the AHS Annual Banquet on June 6. Congratulations to you both! ANAHEIM BREWERY "FOUNDERS DAY" ON MAY 18th!